Boundaries of Innovation Equip yourself for greater success in engineering. Case Western Reserve University invites you back to the start, where countless alumni have unlocked the tools to fuel new discoveries and heighten their achievements. You can, too. Research alongside today's engineering masters and let their unyielding commitment to excellence steer you toward a more inventive and rewarding future. Become more when you come back. The Case Alumnus is published quarterly for members and friends of the Case Alumni Association, which serves the interests of more than 20,000 alumni of the Case School of Applied Science, Case Institute of Technology and the Case School of Engineering. Established in 1885 by the first five graduates of the Case School of Applied Science, the Case Alumni Association is the oldest independent alumni association of engineering and applied science graduates in the nation. The Case Alumnus is a publication of the Case Alumni Association, Inc., a 501(c)3 public charity under the IRS code. 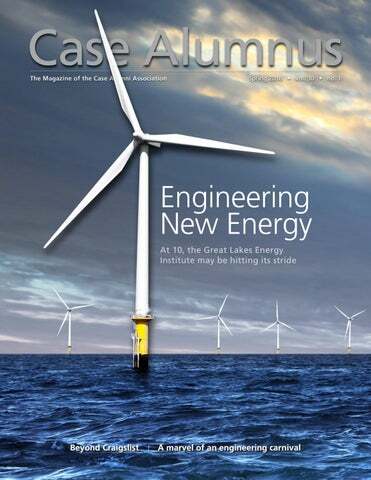 THE MAGAZINE OF THE CASE ALUMNI ASSOCIATION To serve and advance the interests of the Case School of Engineering, the math and applied sciences of Case Western Reserve University and its alumni and students. Craigslist founder Craig Newmark has embarked upon nurturing a new community: female engineers. anniversary, the Great Lakes Energy Institute is leading the region into advanced energy industries. Ten CWRU teams showcased their innovations at CES 2018. What they learned in Las Vegas won’t stay there. flock to the Engineering Challenges Carnival. On the cover: ENGINEERING NEW ENERGY At 10, the Great Lakes Energy Institute may be hitting its stride Researchers at the Case School of Engineering are studying offshore wind farms, like this one in the North Sea, to design America’s first freshwater wind farm on Lake Erie. VISIT WWW.CASEALUM.ORG FOR THE LATEST NEWS AND EVENTS! The best way to stay connected to the Case Alumni Association between magazine issues is to follow us on Facebook, LinkedIn, Twitter and YouTube. Please join our sites today for the latest news on alumni, students, faculty and innovative research and projects. teams of young entrepreneurs—all CWRU students or recent graduates— to compete for $50,000 in prize money March 15 at the Larry Sears and Sally Zlotnick Sears think[box]. Organizers hope to speed her success—in the spirit of a legendary venture capitalist. Cleveland investor David Morgenthaler pioneered the venture capital industry in America and preached the importance of entrepreneurship to Greater Cleveland before his death in 2016. Now his friend and business partner has taken up the crusade. Bob Pavey, a Case Western Reserve trustee, co-founded the contest to honor Morgenthaler and to train new entrepreneurs. He partnered with JumpStart to provide not only prize money but legal resources and mentoring. “No matter which of these excellent startups ultimately takes the top prize, each are driven by promising young entrepreneurs who will benefit from the invaluable expertise our professional partners are so generously providing,” Pavey told The Dailey. The selection process began last fall, when nearly 30 companies submitted ideas to an entrepreneurial finance class taught by Scott Shane, the A. Malachi Mixon III Professor of Entrepreneurial Studies, who is coordinating the competition. The class winnowed the list to a top six. Along with KitcheNet, the finalists include Apollo Medical Devices, Everhire, Hedgemon, ImaginAg and Inspirit. To learn more about the six finalists and the competition, go to www.mpstartup.com/. problems with science as he grew up on St. Joseph Island, near Sault Ste. Marie, in Ontario, Canada. The family moved to Tennessee, and he earned bachelor’s and master’s degrees in physics from the University of Memphis. In 2012, Dr. Hore was awarded his doctorate in materials science and engineering from the University of Pennsylvania, and two years later he came to Case Quad. He lives in Shaker Heights with his wife, Jessie Sun, who is also a materials scientist and who teaches at Laurel School. Cullen, Peter Kummant and Greg Bowser. His time of 24:37.00 in the 8,000-meter race was the best of his career at that distance and the best ever by a CWRU runner at the NCAA Division III Championships. Congratulations, Sam! NineSigma, Inc. and through my academic career, I have found that the engineering workforce at companies do not have an engineering-style textbook on innovation, entrepreneurship and intrapreneurship. My book addresses this gap.” The book is available on Amazon.com and through the publisher, Springer.com. nothing now. Plus, you retain complete control over the assets during your lifetime and can spend the money as you wish. By naming us as the beneficiary, you simply allow for any leftover funds, or a portion of those funds, to transfer to us after your lifetime. These are gifts you can easily set up yourself. Here are the three things you need: 1. A phone. Call the administrator of your retirement plan, bank account or insurance policy. 2. A form. Request a change-ofbeneficiary form. 3. A pen. Fill out the form and return it to the administrator. Then call us to let us know about your generosity! It would be our honor to thank you for your gift. Bring in the Professionals If you have a will and previously worked with an estate planning attorney, it’s a good idea to include that person in your planning process when designating or updating your beneficiaries. Your attorney can make sure that as you add or adjust pieces of your estate plan, it remains cohesive and logical for your current circumstances. To learn more about the Case Alumni Foundation and the opportunities available to establish an endowed fund, please visit casealum.planmylegacy.org/. Craig Newmark of Craigslist fame returned to campus in November and spoke about his new crusade. well-known names in computing, catering to technical and career-related content. The most recent keynote speaker was Melinda Gates, co-founder of the Bill & Melinda Gates Foundation. The conference also offers professional development and a career fair, which provides students the opportunity to interview for jobs and internships. In October 2014, nine female students from CWRU traveled to Phoenix for GHC. In October 2015, 16 women attended GHC in Houston, building on the momentum of the previous year’s trip. “It’s empowering to be surrounded by other women who share my interest in tech,” said Lauren Jahnke ’18, a computer science major. “My favorite part is the panels, where you hear from women in the industry who’ve found success and become executives in their companies, because that’s where I hope to be someday. GHC makes me hopeful about the future for women in tech and inspires me to encourage other young women to pursue a career in technology. I’m glad I could be a part of it.” Computer science major Anna Sedlackova ’19 shares her enthusiasm. “As a software engineering co-op who works primarily in a male-dominated workplace, attending the Grace Hopper Celebration was incredibly inspiring,” she said. “Hearing other women talk about their experiences in computing gave me additional confidence that I can be successful in this field and encouraged me to support all female engineers and scientists in pursuing their dreams.” At the conference’s career fair, each attendee was able to interact with companies that value diversity. Thanks to this opportunity, Sedlackova received a summer internship offer in the Bay Area with Apple. “I would highly recommend the Grace Hopper Celebration to any female in STEM because it has not only made me a better leader and engineer but also secured my job prospects,” said Sedlackova, who is a member of Kappa Alpha Theta and the Hacker Society. A scene from the floor of the 2017 Grace Hopper Celebration of Women in Computing. Newmark says the tech industry needs more skilled workers, which should mean a lot more women in computing. However, the industry hasn’t treated women fairly, says Newmark, who supports organizations such as the Women’s Startup Challenge and Girls Who Code. WE17, which is billed as the world’s largest and most prestigious conference for women engineers, is another important event for women in technology. Last year, WE17 was held with the theme of “Always Connecting ... Always Engineering.” Exhibitors included companies such as 3M, Accenture, Amazon, Apple, Raytheon, Rockwell Automation, Siemens and Texas Instruments. The conference provided women ways to connect, discover career opportunities and pursue professional development. “Every company exhibiting at SWE (WE17) is hiring for tech positions, so there are a lot of opportunities there,” says Jahnke, who attended the conference three years ago. “I found my first college internship at SWE. The best thing I got out of it, besides an internship, was practice talking to companies and recruiters.” Providing these opportunities for women will help close the gender gap in the tech field, Newmark believes. “I want to create a new normal about women in tech, so we need to keep talking about it until it doesn’t seem all that unusual,” he said. For more information about the Grace Hopper Celebration, visit ghc.anitab.org. For information about SWE, visit we17.swe.org. Professor David Zeng is designing foundations for turbines that will rise about 8 to 10 miles off the coast of Cleveland. thinks those might not be far away— especially if the state legislature becomes friendlier to renewable energy. “We need good public policy at the state level—coupled with good research at our universities—that will lead to jobs in the private sector,” he said. “We’re getting close. I think Case has done a marvelous job.” Among the many projects being coordinated by the institute, two readily illustrate the power of GLEI to create new energy systems—and maybe launch new industries in the Great Lakes region. Zeng, whose research is being funded by the U.S. Department of Energy, has studied turbines designed for northern Europe, including those in the North Sea. But the comparisons are not exact. “This will be the first one in freshwater—with ice. Even the Europeans have very little experience with this,” he said. “It’s not just ice. Our ice moves, up and down.” Zeng and his team, which includes research associate Xeufei “Sophie” Wang, have designed an “ice cone,” or a conical shield at the water level, that ideally will ward off or break apart encroaching ice. Such a “facemask” has been used before on bridge piers, Zeng said, but not on windmills. So far, it’s working in the lab. “We’re making progress,” he said. He said he hopes to soon have a design ready for LEEDCo. Turbines are scheduled to rise in the lake in the summer of 2020. And that’s just the start. Wagner, Richard and others envision hundreds of windmills powering a new Great Lakes energy industry. Success, they know, hinges on an engineering team solving a problem no one has confronted before. Sophie Wang and David Zeng at the centrifuge. distribution technology. That’s what attracted Siemens, which plans to invest in classes and labs that will train the next generation of power system engineers. Those engineers will run a highly technical system that can accommodate cleaner, greener energy sources. “The current infrastructure we have cannot support that level of integration,” said Kenneth Loparo, PhD ’77, the Nord Professor in the Department of Electrical Engineering and Computer Science and an expert on power transmission. “How do we develop the distribution system of the future? It’s not an event. This is an evolution.” In collaboration with FirstEnergy and other corporate partners, CWRU researchers are developing and testing new distribution systems. The Mandel project complements demonstration sites on Case Quad, where smart building controls—and a 125 kW battery from Johnson Controls—are integrating new energy systems into old engineering buildings. There’s not enough sunlight to power a whole building on campus, but there’s enough to test a strategy. Using solar panels, a storage battery and new smart invertors from Eaton Corp., researchers plan to design a control architecture that will stream solar energy into the Mandel building’s power supply at optimal times— integrating renewable energy with power from the grid. If it works, the concept will be applied to other campus complexes and maybe sections of the city, creating stand-alone microgrids that researchers think represent the future of energy transmission. Xyla Foxlin was a popular interview at her booth at the entrance to Case Row. Case Row attracted a steady stream of visitors in the University Innovation section of Eureka Park. lends her pitch the fervor of a crusade. But she credits CES experience with helping her to gain confidence and shape an effective delivery. “You learn things. You learn what works,” she said, gesturing toward her booth. “I have a theater tech background, and this is essentially a stage set.” Plus, she’s learned to cool her emotions. “The more professional you are, the more people will take you seriously,” she said. LaunchNet director Bob Sopko, right, led the teams to CES 2018 for the fifth straight year. Dean James McGuffin-Cawley, left, was a frequent visitor to Case Row. Reflexion Interactive Technologies, co-founded by Matt Campagna, was ranked among the Best of CES by Engadget. training system for athletes—garnering some convention acclaim. Reflexion was named a finalist in a Best of CES 2018 competition sponsored by the tech news website Engadget. Matt Campagna, the company co-founder and a junior computer engineering major, likes CES for the media attention but also for the feedback. “It’s like a giant focus group,” he said. “Just being able to show the technology and see how people use it, you learn a lot. You can make engineering decisions.” After CES 2017, he and his two partners—high school friends who attend Cornell and Penn State universities—modified the touchscreen to make it more responsive, he said. think[box]. One group of visitors from Australia, noted their country had a large elderly population that maybe could benefit from the concept. “It’s a slightly different application, not exactly what I was thinking of,” he said, acknowledging that the word “pivot” popped into his head. Across from Steward, the team of Apollo Medical Devices welcomed visitors who lingered at the technical schematics describing a fast, inexpensive, portable blood-testing device. “Today has been crazy,” said company founder Punkage Ahuja, who earned his master’s degree in biomedical engineering from CWRU and is now a doctoral candidate. He had had conversations with representatives of Bayer, CVS Health, Fitbit and an Israeli investment firm. “This is the best show,” Ahuja added. “You don’t know who’s walking around here, and everyone is walking around here.” That included Michele Jones, the director of product innovation for Akron-based FirstEnergy. She tried out the HoloLens glasses at NE Ohio Immersive Technologies and chatted with several of the students at their exhibits. “I think it’s amazing,” she said. “You’ve got a lot of great things here. Erica Kraus, the Student Operations Lead for think[box], helps set up Case Row. Punkage Ahuja, founder of Apollo Medical Devices, talks with a representative of an Israeli investment firm. said it was the largest turnout of her tenure and probably the largest in the history of the event. She credited years of networking with area schools and educators and an outpouring of support from engineering clubs and student groups. “It wouldn’t happen without the student volunteers,” said Labat Joseph, the Director of Engineering at the Leonard Gelfand STEM Center. “The beauty is, they’re doing things that are specific to their interests,” like demonstrating how to launch a rocket or design a bridge. The children, meanwhile, learn there is more to STEM than solving math equations and memorizing formulas. There’s invention, wonder and imagination. aterials science researcher John Lewandowski, PhD, is a competitor, and his competitiveness can be seen on the track. In 2013 and 2017, Lewandowski, who is 60, participated in the National Senior Games, first in Cleveland and then in Birmingham, Ala. Last year, he ran fast enough in the 800- and 1500-meter races to earn Masters All-American status while placing 6th and 4th, respectively. He also participated in the 200- and 400-meter races, placing 22nd and 12th, respectively. In 2013, he placed 4th in the 5K, as well as 10th in the 400, 6th in the 800 and 5th in the 1,500, where he also earned Masters All-American status. Not bad for a college professor with a demanding schedule of research, teaching and advising. Lewandowski is the Arthur P. Armington Professor of Engineering II, the Director of Advanced Manufacturing and the Mechanical Reliability Center, and a professor in the materials science and engineering department at Case School of Engineering. He has mentored over 100 graduate students (MS, PhD) and 50 postdoctoral researchers and visiting scholars at CWRU. Publications and presentations with his mentees run into the hundreds. for a sabbatical in 2003-04, he ran then, too. Four runners he trained with in England participated in the Olympics in Beijing in 2008, and two competed in the London Olympics in 2012. “I like the competitive nature of running,” he says. “You show up at a specific time and place. It’s black and white. And it’s all up to you to train.” In 1986, Lewandowski came to CWRU to conduct research and teach, tabling his running for years because he was busy working and helping his wife, Amy, raise their two boys, the first of whom was born in 1990. (John Robert, BS ’12, MEM ’13, is a PhD student at MIT, and the other, Mark Edward, BS ’16, is earning a master’s at CWRU.) Even though Lewandowski wasn’t running regularly, he stayed in good shape. After taking a break from running competitively for a while, Lewandowski became more directly involved in the sport by participating in track meets and joining the Cleveland Southeast Runners Club in 1999. He also developed his own training regimen throughout the years and competed annually in both the Hermes Road Race Series and the Ohio Challenge Series. Road races ranged in distance from 1 mile to 5K and 10K, as well as a few half marathons. John Lewandowski, center, is running strong midway through the 800-meter final at the 2017 National Senior Games in Birmingham, Ala. He finished 6th. Kimball D. Smith ’39 Pasadena, CA Kimball wrote to report that he is now 101 years old and in “good shape.” Also, he shares that world events delayed his graduation. He was on track to graduate from the Case School of Applied Science in 1938 but, while a foreign exchange student in Munich, was delayed in Germany by the Nazis, and thus graduated in 1939. Daniel Saunders ’48 Bedford, OH Daniel celebrated his 91st birthday on Aug. 17, 2017. George G. Pinneo ’59 Manhattan Beach, CA George, a science fiction writer, engineer and space enthusiast, has published the fifth book in his “Bergmann” series, “Bergmann’s L5 ORBITAT ” (CreateSpace Independent Publishing, 2014). It was featured at the Frankfurt International Book Fair in Frankfurt, Germany, in October 2017 and is available via amazon.com. now that I’m not worried about feeding the family, I try to spend more time helping others.” Donald Knuth, PhD ’60 Stanford, CA Marquis Who’s Who named Donald a lifetime achiever. A distinguished professor emeritus at Stanford University, Donald bears the honorary moniker of “father of the analysis of algorithms.” He first published “The Art of Computer Programming” in 1968 and also designed the computer typesetting system TeX and the companion language, Metafont. Studies, delivered the Provost Lecture at the University of Pittsburgh’s Science 2017 conference in October 2017. His talk was titled “Neuroscience in the Age of Information.” He is one of only 10 living scientists elected to all three national academies: the National Academy of Engineering, the National Academy of Medicine and the National Academy of Sciences. Marc Milstein ’72 Austin, TX Marc joined the University of Texas Southwestern Medical Center, an academic medical center, as vice president of information resources and chief information officer. Stephen Becker, MS ’74, PhD Los Alamos, New Mexico Steve, an astronomer and astrophysicist in New Mexico, participated in discussions about black holes, the solar eclipse and NASA probes as part of Nature on Tap, a discussion series started by the Los Alamos Creative District. He is president of the Pajarito Astronomy Club. In 1995, he made it as far as the interview stage of the astronaut selection process. Allan Reid ’74 Zionsville, IN Allan is an attorney for Foley Panszi Law in Zionsville, IN, and focuses his practice primarily on criminal law. He’s a former master commissioner in the criminal courts of Marion County. Prasan Samal, MS ’81 Johnstown, PA Prasan is a 2017 APMI Fellowship Award recipient. Retired, Samal helped develop and qualify stainless steel components for use in automotive exhaust systems. Terri G. Kinzy, PhD ’91 Kalamazoo, MI After a nationwide search, Terri was named vice president for research at Western Michigan University, effective Jan. 8. Previously, Terri served as vice president for research and professor of biochemistry and molecular biology at Rutgers University. Class Notes Leslie Kindling ’95 Arlington, VA Leslie, a two-time NCAA track champion, ran in the 2017 Boston Marathon. She is an aerospace and operational physiologist with the U.S. Navy. Daniel Wierzbicki ’99 Mentor, OH Daniel is a supervisory special agent—Criminal and National Security Cyber Investigations—for the Chicago division of the FBI. Micah Litow ’04, MEM ’05 Mequon, WI Micah is chief marketing and business development officer for Preora Diagnostics, a privately held medical technology company developing low-cost cancer screening tests. Michael Fu, MSE ’06, PhD ’11 Cleveland, OH Michael is an assistant professor in the electrical engineering and computer science department at CWRU. He is also a scholar working through the Mentored Clinical Research Scholars (KL2) program at the Case Western Clinical and Translational Science Collaborative in Cleveland. Through the program, he tested video gameassisted electrical stimulation therapy with children with cerebral palsy and found that it helped them. He has received independent funding to test the therapy in a larger clinical trial. Preston DeFrancis ’02 Los Angeles, CA Preston wrote a feature-length horror movie, “Ruin Me,” which was produced by his wife, Rebecca Stone. The movie premiered Aug. 27 in London at the horror film festival FrightFest. Mario Mazza ’03 North East, PA Mario is the driving force behind Five & 20 Wine & Brewing in Westfield, NY. It’s the state’s first distillery/brewery/winery. Mazza worked for DuPont in Australia and brought back ideas about the distillation process after earning a master’s degree in oenology (wine) and viticulture (growing grapes) at the University of Adelaide in Australia. John DiBella ’01, MEM ’04 Granada Hills, CA John is president of the Lancaster, CA, division of Simulations Plus, a developer of drug discovery and development software. Melissa Gonsalves MEM ’07 Cleveland, OH Melissa is the product manager of low temperature sterilization solutions at Steris Corporation. She’s responsible for the development and distribution of hydrogen peroxide gas sterilizers. In addition, she co-authored a study about the challenges of extended steam sterilization cycles. was acquired by LivingSocial in 2012. At Onosys, Yakubovich led the operations team and helped the company become one of the largest online ordering providers in the U.S. Christopher Crane ’08 San Francisco, CA Christopher is co-founder and vice president of product at Scout RFP, a sourcing and procurement software company. Previously, he worked for Erico, a manufacturer of electrical grounding, bonding and connectivity products that’s now part of Pentair. In Memoriam champion in the high jump, four-time All-American, and NCAA decathlon champion. He completed his Master of Science in biomedical engineering at Cleveland State University in 2014. Tim Sykes ’10, MEM ’11 Houston, TX Tim, a former Spartan wrestler who now lives in Houston, was visiting family in Greater Cleveland when Hurricane Harvey hit. He scrambled to raise funds and transport donated supplies back to Houston, a mission that captured the interest of local TV news: tinyurl.com/y896z8w6 Kate Schmitmeyer ’14 Versailles, OH Kate became engaged to Benton Collins. Mustafa Unal PhD ’16 Cleveland, OH Mustafa, a recent alumnus of the Department of Mechanical and Aerospace Engineering, has received the 2017 Ten Outstanding Young Persons (TOYP)—TURKEY award from Junior Chamber International (JCI). He was honored in the medical innovation category for research conducted at Case Western Reserve. Send your updates, including photos, about job promotions, professional development and personal milestones to casealum@casealum.org. This is the car Larry Sears bought off the street in Little Italy in 1968. If you were the owner, he would love to hear from you at sears@case.edu. Larry Sears spent about three years restoring his college car, which is again being seen on campus. n 1968, in his junior year at Case Institute of Technology, Larry Sears, ’69, lived with a group of fraternity brothers in a house in the Coventry area of Cleveland Heights. His walk to campus took him down Edgehill Road through Little Italy. “I would pass this sad, banged-up little car, parked near the intersection of Edgehill and Overlook. It was a red, two-seat, 1957 MGA roadster. Surprisingly, it wasn’t that badly vandalized, but after a few months it was clear that it wasn’t going anywhere. There was a Phi Delta Theta sticker on the car, so I went to the fraternity house, asked around, and found the owner. He had taken a job, I recall, in Denver, and he certainly wasn’t going to get there in that car. I offered him $75, which I didn’t have but I was able to borrow it. “I managed to free up the stuck brakes, and I reattached the carburetors, which were in the process of being stolen. The accelerator cable was gone, so I replaced it with a string which I operated by hand. I was able to carefully drive the car a few blocks back to my house. “With my limited resources, which included spray cans of Rust-Oleum to disguise the duct tape, I was able to slow the car’s deterioration and keep it running for a number of years. “I had a great time in that car, and it provided the ultimate cheap date. Once, when I was particularly cool, I spun around a corner and the door flew off and slid across the intersection of Cornell and Murray Hill. Another time the exhaust system fell off; I’m sure my date enjoyed sitting next to it as I drove her home. (Probably as much as she enjoyed sitting next to me.) “A couple of years later I met Sally Zlotnick (Mather ’72), and she eventually married me. By then the car’s frame had pretty much rotted away and its demise was in sight. Busy with family and career, I disassembled the car and put away the pieces in various locations. Eventually, much of the car ended up being stored outside for almost 40 years. Support the Case FundÂŽ today! Bringing ideas to life for current and future engineers, scientists and mathematicians. Make your gift to the Case FundÂŽ, the annual fund for the Case School of Engineering and math and applied sciences at Case Western Reserve University. Invest in the next generation of makers, innovators and entrepreneurs.